Mercedes Benz announced details and new pictures of the US version of the CLS63 AMG 2012. Check it out after the jump. Exciting design, ultimate performance and ground-breaking efficiency: this is what the new Mercedes-Benz CLS63 AMG is all about. 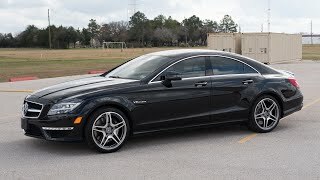 The top-of-the-range version of the four-door coupe is equipped with the newly developed AMG V8 biturbo engine, featuring a peak output of up to 550 hp and 590 lb-ft. of torque, as well as the AMG SPEEDSHIFT MCT 7-speed sports transmission. On top of this, the vehicle's estimated fuel economy of 16 mpg city and 21 mpg highway represents an improvement of 32 percent compared with the previous model. The combination of an AMG RIDE CONTROL sports suspension with electronically controlled damping system and new front axle, newly developed electromechanical AMG sports parameter steering, and also optional AMG ceramic high-performance composite braking system, is synonymous with maximum driving dynamics. Visually, the CLS63 AMG impresses with its athletic appearance and distinctive exterior and interior design. The model's standard specification also includes innovative LED High Performance headlamps. The 2012 CLS63 AMG goes on sale in the U.S. this summer. "The new CLS63 AMG continues the success story of the previous models, the CLS55 AMG and CLS63 AMG, which have delighted our customers all around the world since 2004", according to Ola KŠllenius, Head of Mercedes-AMG GmbH. "The CLS63 AMG is a unique high-performance car – it sets new standards in design, performance and efficiency." As with the S63 AMG and CL63 AMG, drivers of the CLS63 AMG will benefit from an eight-cylinder powerhouse, designated internally as the M 157: the new AMG 5.5-liter V8 biturbo engine boasts a combination of innovative high-tech components which, in addition to spray-guided direct gasoline injection with piezo injectors, also include a full aluminum crankcase, four-valve technology with camshaft adjustment, air/water intercooling, generator management and stop/start system. The weight-optimized AMG sports exhaust system with dual twin chrome tailpipes ensures a distinctive engine sound. With a displacement of 5,461 cc, the eight-cylinder engine develops a peak output of 518 hp and torque of 516 lb-ft. In conjunction with the AMG Performance package, these figures increase to 550 hp and 590 lb-ft. Both variants of the CLS63 AMG achieve exceptional performance: acceleration from zero to 60 mph takes 4.4 and 4.3 seconds respectively, and a top speed of 155 mph (electronically limited). The major difference between both power units is the increase in the maximum charge-air pressure from 1.0 to 1.3 bar. In addition, the CLS63 AMG with the AMG Performance package features a unique carbon fiber engine cover. Despite a significant performance increase compared with the previous model, which had a naturally aspirated AMG 6.3-liter V8 engine producing 507 hp and 465 lb-ft. of torque, the new CLS63 AMG is some 4.6 liters, or 32 percent, more economical – which represents a quantum leap forward. Thanks to these figures, the new V8 Coupe from AMG not only undercuts all of its direct competitors in the four-door high-performance coupe segment, but is also more fuel efficient than significantly lower-powered vehicles. Both performance variants have identical fuel consumption. An important contribution towards achieving the unrivaled consumption figures has been made by the AMG SPEEDSHIFT MCT 7-speed sports transmission, a component used exclusively at Mercedes-AMG. Unlike a conventional automatic transmission, the MCT transmission does away with the torque converter; instead, it makes use of a compact, wet start-up clutch. Also fitted as standard equipment is the stop/start function: it is permanently active in the transmission's Controlled Efficiency ("C") mode, and switches the eight-cylinder engine off when the car comes to a stop. At the same time, "C" mode also means a "soft" accelerator response set-up with convenient and early gearshifts; moving off generally takes place in second gear. A green "ECO" symbol in the AMG instrument cluster shows the driver that the stop/start function is active. The engine and transmission come across as much more agile in the "S" (Sport), "S+" (Sport plus) and "M" (Manual) modes; in addition, the stop/start function is switched off. In "S", "S+" and "M" modes, the engine management system partially suppresses the cylinders: interrupting ignition and injection under full load leads to even faster gearshifts than before. The highly emotional vocals are an appealing side effect of this lightning-fast process. An automatic double-declutching function and RACE START function are also included as standard. The suspension, steering and braking system of the new CLS63 AMG complement the high-tech drive system perfectly. The AMG RIDE CONTROL sports suspension, with steel suspension struts on the front axle and air suspension struts on the rear axle, as well as automatic level control, is enhanced further by an electronically controlled damping system; it automatically adjusts the damping characteristics depending on the driving conditions and reduces the roll angle of the body. The result: lightning-fast adjustment between optimum driving comfort and the best possible agility. The driver can switch between the three suspension modes of "Comfort", "Sport" and "Sport plus" at the press of a button. The autonomously developed front axle, with a track width which is 0.04 in wider, is the optimum match for the newly developed electromechanical AMG sports parameter steering. It features a more direct ratio, variable power assistance which adapts according to the suspension mode, and also contributes towards reducing fuel consumption by up to 0.08 gallons in the ECE fuel cycle, since the steering assistance system only draws power when the vehicle is actually being steered. Perfect deceleration even when driving extremely briskly is provided by the AMG high-performance braking system with 14.2 in, internally ventilated and perforated brake discs all-round. Especially resistant, motorsports-tested composite technology is used on the front axle. The optional AMG ceramic high-performance composite braking system with yet larger brake discs provides an even higher level of braking performance as well as lower unsprung masses. Good contact with the road, meanwhile, is provided courtesy of the titanium grey-painted, high-sheen AMG light-alloy wheels featuring a new triple-spoke design and fitted with 255/35 R 19 tires on the front and 285/30 R 19 tires on the rear. The AMG light-alloy wheels are manufactured using the weight-optimized flow-forming process, as already used on the SLS AMG. The highest level of engineering is also reflected in the body of the new CLS63 AMG: the intelligent lightweight construction makes a significant contribution towards addressing the classic conflicting goals of low weight and high strength. Like the SLS AMG, the CLS63 AMG is also fitted with doors featuring a full aluminum construction. They consist of deep-drawn aluminum panels with extruded sections, and are around 53 lb lighter compared with conventional steel doors. In addition, the hood, front fenders, trunk lid, parcel shelf, various support sections as well as major parts of the chassis and engine are all made from aluminum too. been able to use LED technology in the Adaptive Highbeam Assist, resulting in an entirely new level of safety when driving at night. In contrast to the first vehicles equipped with LED headlamps, no compromises are now necessary with respect to the functionality and performance of the lighting technology. There are further arguments for the new, LED-based lighting technology: the average operating life of an LED is around 10,000 hours, around five times longer than that of a xenon light; moreover, LED headlamps most closely approximate the color temperature of daylight. This means that LED light is in keeping with normal human perception patterns. Studies have shown that the closer the color of artificial light comes to daylight, the less strain there is on the eyes. With a color temperature of 5500 kelvin, LED light is closer to daylight (6500 K) than xenon light (4200 K). The LED daytime driving lights specific to AMG are also presented in two characteristic light strips integrated into the AMG front apron. When viewed from the front, the new CLS63 AMG evokes associations with the SLS AMG – the radiator grille in particular, with its large Mercedes star and wing-shaped horizontal slats, appears to have been inspired by the gullwing. The top-of-the-range AMG model distinguishes itself from the other CLS variants with its distinctive hood, wider mudguards with "V8 BITURBO" logo and a specific AMG front apron with black painted cross member. Eye-catching features at the rear include the diffuser insert, the AMG spoiler lip on the trunk lid, the AMG sports exhaust system with dual twin chrome tailpipes, and - as also featured on the SLS AMG - integrated rear foglamp. The AMG bodystyling perfectly matches the typical CLS outline, which is essentially characterized by the elegantly long proportions, the lateral dropping line and the muscular sports car-like shoulder line above the rear axle. This philosophy also continues through consistently into the interior. All of the AMG-specific design and appointment features ideally supplement the redesigned CLS interior. The wrap-around effect in the cockpit, with its high line which sweeps from the driver's door over the instrument panel support and across to the front passenger door, is generously flanked by high-quality trim elements – available in black piano lacquer as standard in the top-of-the-range AMG model. Quality materials and workmanship meet the very highest of standards and help to provide an especially exclusive atmosphere. The extensive range of standard appointments also includes AMG sports seats in nappa leather, a new three-spoke AMG Performance steering wheel with aluminum shift paddles and flattened top and bottom sections, and the AMG DRIVE UNIT with compact E-SELECT selector lever. More than a dozen driving assistance systems on the new CLS help to prevent traffic accidents and reduce the severity of an accident. The Active Blind Spot Assist and the Active Lane Keeping Assist are new. Active Blind Spot Assist warns the driver if the short-range radar sensors detect that there is a danger of collision if the vehicle is about to change lanes. Should the driver ignore the warnings and come dangerously close to the vehicle in the next lane, Active Blind Spot Assist will intervene. By applying braking force to the wheels on the opposite side of the vehicle via the Electronic Stability Program ESP¨, a yaw movement is created which counteracts the collision course. Active Lane Keeping Assist is now also linked to the ESP¨for the first time. This system kicks into action if the driver inadvertently drifts over a solid line to the right or left of a lane. In this case, Active Lane Keeping Assist brakes the opposite wheels and thereby prevents the vehicle from crossing the line. A display on the instrument cluster warns the driver at the same time. If broken lane markings are crossed, the system controls an electric pulse generator in the steering wheel which generates vibrations for a short time – a discreet but highly effective cue to countersteer immediately. Before the braking system intervenes, the steering wheel always vibrates to provide a warning. The new CLS63 AMG will be celebrating its U.S. market launch in Summer 2011.